Update 23: Dominate with the Trebuchet! Last week we added the dye system to Conan Exiles, letting you color of your clothes and armor to create your own look, and soon you can explore an all new and brutal dungeon in the sewers beneath the Unnamed city. But this week we are introducing the powerful trebuchet siege weapon so you can smash through the defenses of your enemies! The trebuchet is the first siege weapon in the game, but when the full siege update arrives later, you will be able to make even more such powerful machines. The trebuchet fires heavy siege boulders which hit hard and can bring down any building. The boulder does damage both when it hits and when it bounces and rolls, so it can destroy several building pieces at once if you are clever and lucky when firing. Under most circumstances it will still take two hits from a siege boulder to smash through a sandstone wall, and several more to bring down stonebrick or reinforced stone, so attacking enemy strongholds will take time even with a trebuchet. This allows defenders to mount a counter-attack, because if they can rush the attackers the trebuchet itself is quite vulnerable. The trebuchet not only fires boulder but can also fire the brutal demon-fire barrage. This is a cluster of explosive jars which does heavy area of effect damage when it hits in an explosion of fire. The demon-fire barrage is of course very effective against fortifications, but it can wreak extreme havoc when lobbed over enemy walls where it can destroy clusters of crafting benches, thralls or even players, unsuspecting of their impending doom. You can make the trebuchet after learning the Engineer feat which becomes available at level 15. 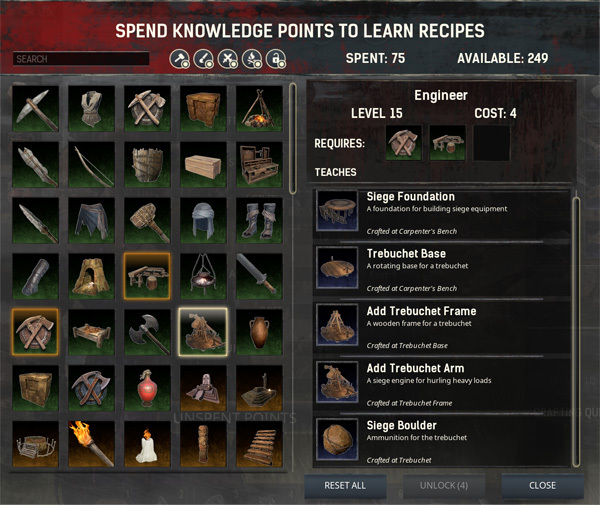 It allows you to construct a siege foundation and trebuchet base at the carpenter’s bench, and gives you the recipes for the trebuchet frame, arm and boulder. The frame and arm are upgrades to the base and the boulders need to be made in the trebuchet. You get the recipe for demon-fire barrage when you learn the explosive jar feat at level 38. Mastering the trebuchet is like a little game in itself. To set it up you first have to place a siege foundation, then a trebuchet base before you can upgrade it twice to have the final war machine. To aim the trebuchet, you must push on its sides, until it’s facing the direction you want. The distance of your shot is determined by how much counterweight you put in. The more weight you have added the further you can shoot, up to the max range of the war machine. This means it will take you some time to learn to use the trebuchet effectively. When you are attacking an enemy stronghold, you may not have much time to bring down their walls, so every shot which misses its target increases the chances of the attack failing altogether. Since the only parts of the trebuchet you can build in the security of your base is the siege foundation and base, you will need to carry both those pieces and the rest of the resources needed to finish it to the place you are attacking. In addition, you also need to carry both the counterweight and ammunition (unless you are making the ammunition on the spot). This means that setting up a trebuchet requires you to carry quite a lot of weight, but also that it takes quite a bit of time. You will be very vulnerable while setting up the trebuchet, so bringing friends along to help speed up the process and protect you will be very valuable. The trebuchet takes a bit of damage every time you fire it, so for a prolonged siege you will need to repair it often. If you and your clan can mount an attack using several trebuchets, you can really deal devastating damage to your opponents in a very short time. Get ready for the rules of attack and defense to change with the trebuchet. It can hurl boulders at great distances and bring down fortifications built on high mountains. 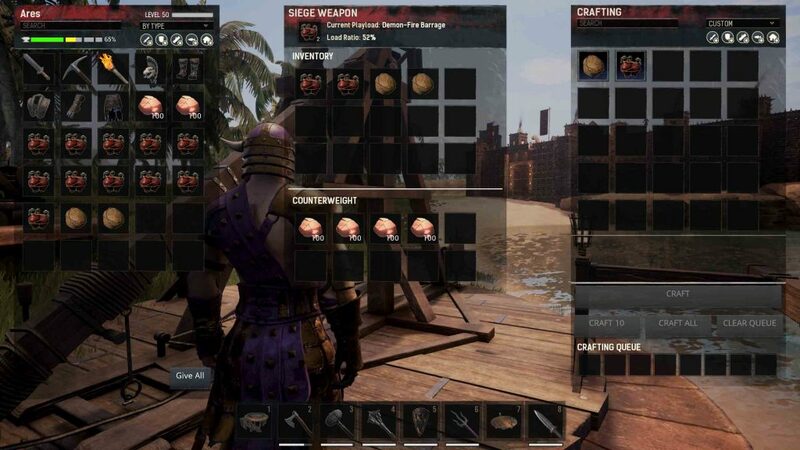 Siege warfare is still both costly and time consuming though, and the trebuchet itself is vulnerable to attack, but with this powerful new weapon in the arsenal of the attackers, base builders may need to rethink their strategies and improve their defenses.